Creativity knows no boundaries when it comes to sweet treats. The centuries-old tradition of the Slovene beekeepers can be appreciated within a rich selection of different honeys (flower, forest, acacia, linden and spruce) and tasted in many delicious traditional dishes. Slovenian honey is known to be of high-quality, full of flavour and very healthy. Enjoy honey tasting while learning about the amazing world of bees. Indulge in sweet honey delicacies and take pleasure in the local api-cuisine. In Radovljica, stop at Lectar restaurant’s traditional honeybread workshop. 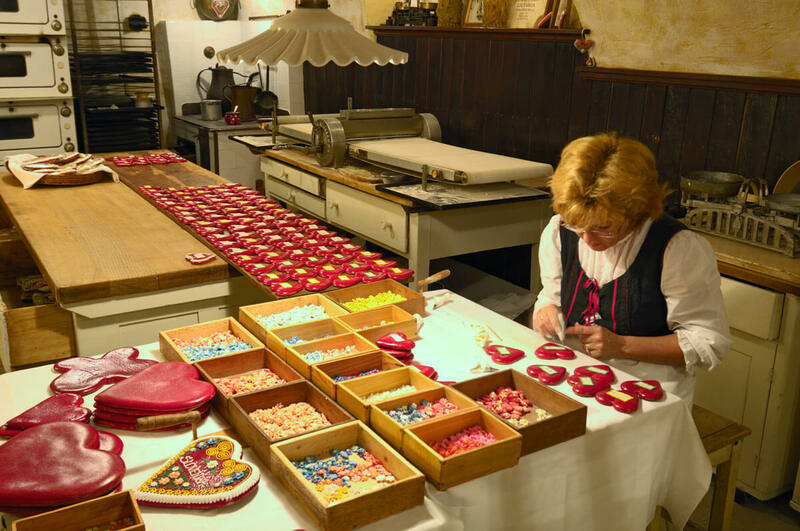 Their exhibition of the traditional honeydew hearts will make you wanting to decorate a honey-bread heart yourself. It will be your sweetest and dearest DIY souvenir to take home. Local restaurants honour the sweet tradition by including in their menus their signature honey dishes. Visit Lectar Restaurant, Vila Podvin, Kunstelj Inn, Draga Inn, Restaurant Tulipan and Lambergh Château & Hotel Restaurant to find out which one is your favourite. While visiting Gorje, another place where you can indulge in a honey menu is the restaurant Pr ‘Jagru. It just tastes delicious!